The star of the show on a soggy Wednesday evening at Jordan Hall was an avant-garde troubadour from France, Tristan Murail, this year’s composer in residence for the annual SICPP festival (“Sick Puppy’’ to friends) at New England Conservatory. Three large Murail works, including a world premiere (“Lachrymae’’), dominated a fresh and energetically performed program. For Murail, what matters is pure sound, not narrative or development. His compositions offer little in the way of linear movement, or, for that matter, melody. When completed in 1977, his “Territoires de l’Oubli,’’ for piano solo, established his reputation as leader of the “spectral’’ movement, named for its exploration of the harmonic spectrum. “Territoires’’ (“places of forgetting’’) requires the pianist to depress the damper pedal throughout the 30-minute piece. So when a piano key is struck, the sound continues to resonate into infinity. As the poised and remarkably dexterous pianist William Fried showed in his surprisingly lyrical performance — created not only with fingers but fingertips and knuckles and fists — the result is a ghostly mingling of past and present sounds in a hypnotic landscape of memory. A rich, densely impressionistic sonic canvas emerges, recalling Debussy, and Monet’s paintings of cathedrals bathed in multicolored fog and mist. “Lachrymae,’’ written for NEC’s Callithumpian Consort, displayed a more intimate and emotional aspect of Murail’s personality. Scored for chamber ensemble (string quartet plus flute and double bass), it was inspired by the “Lachrymae’’ (“tears’’) genre popular in the Renaissance and early Baroque eras. The flute part (played exquisitely by Jessi Rosinski) carries a message of pastoral lamenting. 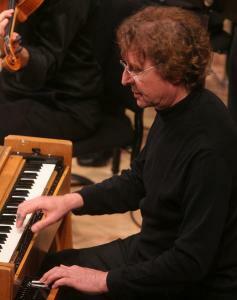 Stephen Drury, artistic director of SICPP and founder of the Callithumpian Consort, conducted with ease and grace. “Lachrymae’’ seems destined to establish itself in the contemporary chamber music repertoire. Murail’s “Le Lac,’’ composed in 2001 and already an Internet classic, ended the program. Nineteen performers, including two percussionists on a dazzling array of drums, metal sheets, and giant rattles, produce a shimmering visual/sonic impression of a lake, complete with echoing bird calls. Although Murail is known for his experimentation with electronics and computers, the pieces heard Wednesday employed conventional acoustic orchestral instruments. Two other works served as hors d’oeuvres for the Murail entrées: “Okanagon’’ by Giacinto Scelsi, for harp, tam-tam, and double bass, an experiment in ritualistic sound performed behind a black screen; and Joshua Fineberg’s “Counterfactual,’’ a riff on “Okanagon’’ written for the Callithumpian Consort. Harlow Robinson can be reached at harlo@mindspring.com.